This is a neat looking bridge spoon. The spiral shape of this bridge is absolutely unbelievable. I have been told that the bridge was made in this strange fashion because the soil at the beginning and end points was not adequate to support the structure. Until this time, bridges were made of wood, stone, cast iron or earth. These technologies worked for small chasms, but they were incapable of being used in larger situations or over bays or large rivers. Of great significance, new technology in steel production combined with innovative concepts would greatly expand the role of the bridge in linking communities separated by large water chasms or rivers or other waterways. 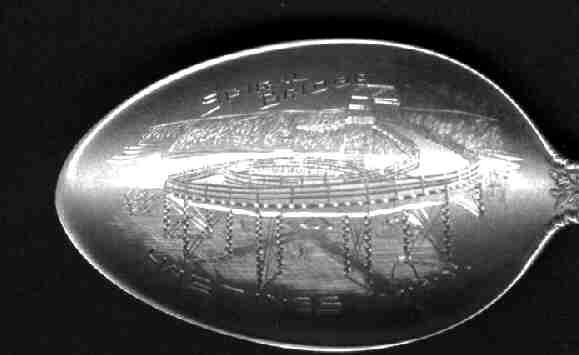 The Eads bridge in St. Louis was a pioneering effort in the application of this new technology and it is celebrated on many spoons. The new concepts tried in this bridge proved that they would work. Perhaps of even greater significance is the Brooklyn Bridge which used daring new suspension technology combined with innovative artistic and structural designs. Besides being a monument to man's ability to span large ocean waterways in an urban setting it created the opportunity to link New York City to Brooklyn creating one of the world's greatest metropolises. The significance of this bridge and the new technology was far reaching and has affected virtually every major city in the world. 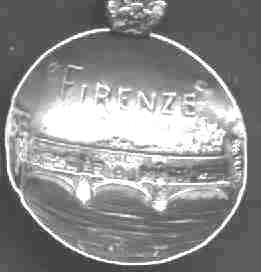 ("The air-bridged harbor that twin-cities frame” in the Lazarus poem engraved on the Statue of Liberty is a reference to this bridge.). Spoons showing the Brooklyn Bridge are almost exclusively of a souvenir nature. 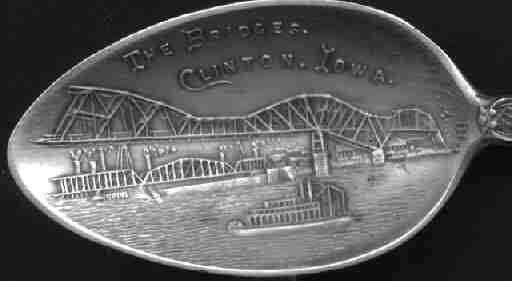 The bridge was a major tourist draw, and spoon makers capitalized on its importance. One correspondent has almost 250 spoon varieties of the Brooklyn Bridge in his collection, which is a very impressive achievement. 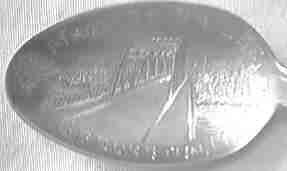 A nice skyline spoon representing the Victoria Bridge, Montreal, Canada. The bowl also has a nice Racine Rapids picture. At its opening the Victoria bridge was called an "engineering marvel" and the "8th wonder of the world". This unique one mile long iron tube bridge spanned the St. Lawrence River. At first the only way across the Colorado River was by a rope ferry. The Red Rock cantilever bridge (near Needles, California) was finished in 1890 and carried a transcontinental railroad over the river. Only a few years later, there was a need for a way to get the many automobiles over the river. One solution entailed having cars go over the tracks while trains were not using the bridge. The dangers of this solution are obvious and another bridge was built. This spoon was manufactured and sold by the Fred Harvey company which specialized in traveler's needs. The back of this spoon also has a most unusual picture of an indian selling "beadwork". The picture is with the indian spoons. Monroe St.bridge spanning the Spokane River (Spokane, Washington), with a beautiful view of the Spokane falls. When it was first opened on Nov. 3, 1911 it was the largest concrete span bridge in the world. In addition to these major engineering feats, we frequently find smaller bridges on spoons because the local residents realized their great importance to the local community. 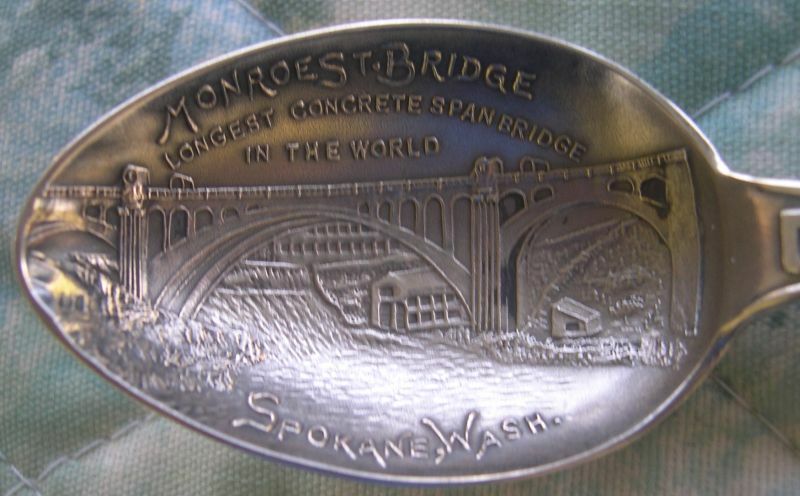 Almost all of the local bridge spoons were commemorative of their grand opening. The famous Golden Gate Bridge in San Francisco is not engraved in any spoon bowls which I have seen, because it was built after the time that this activity was being done. It is represented on very few spoons because the spoon craze was over before it was built. 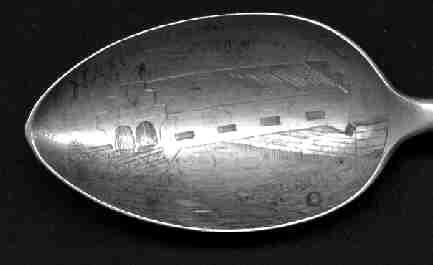 There are a number of spoons engraved with a scenic pictorial of the Golden Gate Harbor, but of course they do not show the bridge which did not exist yet. The reverse says "authentic piece of the London Bridge"
This silver plated spoon was probably a souvenir of when the London Bridge was moved to Lake Havasu, California. In ancient Roman times the building of bridges was considered to be one of the supreme activities and one of the highest honors that could be bestowed on a man was the title of "bridge builder". The latin term for bridge--pont-- has come into our language in a variety of forms. The most intriguing is Pontiff, in reference to the Pope. Other Bridges are available, Are you looking for a specific one?